To understand the extent of federal power, we must first understand generally what type of government the Constitution created. During the Philadelphia Convention, many framers favored a strong national government. In fact, James Madison even proposed a federal veto on state laws. But as the convention wore on, delegates voted down proposals to create a centralized government one by one. The Constitution that emerged from the Convention created a federal government with a few, defined, enumerated powers. The Philadelphia Convention reveals much ab out the intent of the framers, but we find the true meaning of the Constitution in the ratification process. The people of states elected representatives to approve or reject the document. The debates in the state conventions illuminate the understanding of the Constitution at the time. In a letter to Henry Lee dated June 1824, Madison affirms this view of constitutional interpretation. Many Americans misconstrue the ratification debates, assuming that those favoring the Constitution (the federalists) advocated for a strong, central government, while opponents (anti-federalists) wanted a weaker general government. In fact, virtually everybody agreed that the Constitution was intended to create a limited federal authority, leaving most power to the states. The debate revolved around whether the Constitution, as written, would create such a government. The federalists insisted that it would, while anti-federalist expressed deep fear that it would not. Published in New York newspapers, the Federalist Papers laid out key federalist arguments and give us a strong sense of how proponents “sold” the Constitution. Madison made the clearest case for the Constitution’s limited nature in Federalist 45. The powers delegated by the proposed Constitution to the federal government are few and defined. Those which are to remain in the State governments are numerous and indefinite. The former will be exercised principally on external objects, as war, peace, negotiation and foreign commerce; with which the last the power of taxation will for the most part be connected. The powers reserved to the several States will extend to all objects which, in the ordinary course of affairs, concern the lives, liberties and properties of the people, and the internal order, improvement and prosperity of the State. While the Federalist Papers shed valuable light on arguments used to “sell” the Constitution to the people, the records of the ratification debates prove even more important and illuminating. Without exception, these debates record supporters arguing vehemently that anti-federalist fears of a powerful national government were unfounded. It was on this basis that the Constitution was ratified. Had the people believed the federal government would morph into the all-powerful entity we see today, they would have soundly rejected its ratification. In fact, several state ratification documents make clear delegates believed they were approving a federal government with few, defined powers. Consider the New York ratification document. 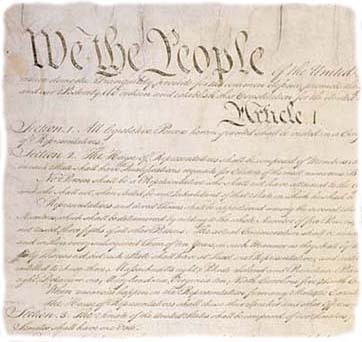 We, the delegates of the people of the state of New York…Do declare and make known…That the powers of government may be reassumed by the people whensoever it shall become necessary to their happiness; that every power, jurisdiction, and right, which is not by the said Constitution clearly delegated to the Congress of the United States, or the departments of the government thereof, remains to the people of the several states, or to their respective state governments, to whom they may have granted the same. St. George Tucker summed up how to view federal power in View of the Constitution of the United States, the first extended, systematic commentary on the Constitution published after ratification. The powers delegated to the federal government, are, in all cases, to receive the most strict construction that the instrument will bear, where the rights of a state or of the people, either collectively or individually, may be drawn in question. So, when considering federal power today, we should always begin with the premise that it was meant to remain limited.